For nearly 170 years we have been creating value for our full ecosystem of stakeholders, from employee shareholders to eyecare professionals to the millions of people who wear our lenses. It’s because our business serves an essential mission – improving lives by improving sight. Providing everyone, everywhere, with access to quality vision care is Essilor’s biggest challenge in terms of sustainable development. With that challenge comes the responsibility to ensure we pay careful consideration to our social, societal and environmental impacts on different stakeholders. Whether it is ensuring the wellbeing and development of our employees, innovating to reduce our environmental footprint or engaging in dialogue with our many stakeholders to uphold ethical business dealings, we fundamentally seek to support the long-term sustainable growth that enables us to fulfill our mission. For a full report on the Group’s corporate sustainability, explore our dedicated chapter 4 in the Essilor 2017 Registration Document. A technological pioneer, Essilor is also an innovator in its governance which is a true reflection of a strong corporate culture characterized by diversity, balance and openness. Essilor’s employees are its largest single group of shareholders: one employee in four is now a shareholder and more than 9,000 employee shareholders are members of the Valoptec Association. Essilor was the first company in the French CAC 40 to incorporate a corporate social responsibility committee within its Board of Directors’ Committees. Chaired by an Independent Director, the CSR Committee comprises three members including the Chairman and CEO. 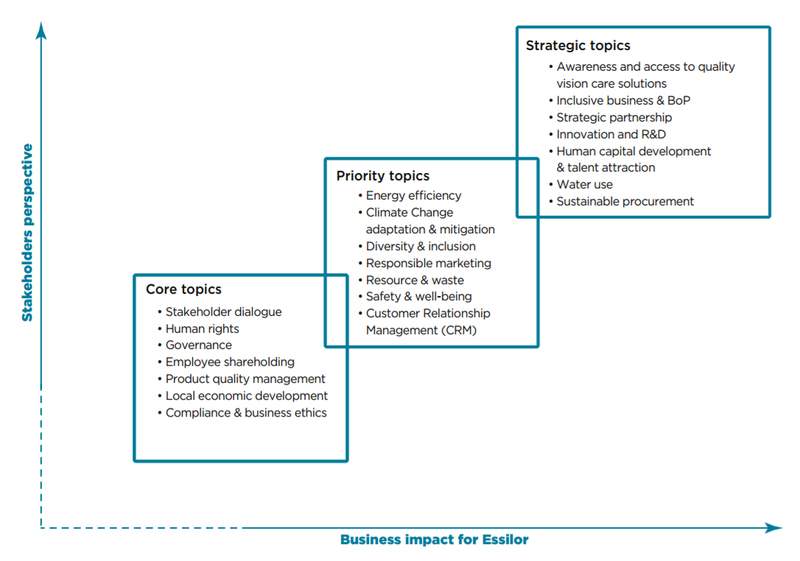 Its main role is to review the sustainable development strategic roadmap, evaluate the direct and indirect economic and societal impacts of the Essilor Mission activities and review the Group’s reports regarding its CSR activities. The Sustainable Development department is regularly consulted by the CSR Committee. It coordinates a global steering committee that brings together the Group’s major functional departments and geographic divisions and provides expertise relating to the analysis and implementation of actions plans seeking to support the group’s sustainable growth. Essilor uses its materiality assessment to anticipate the requirements, risks and opportunities connected with sustainable development. The Group has defined 20 priority areas which form the basis of the Group’s sustainable development strategy and are regularly updated in line with trends in stakeholder expectations and the criticality of the challenges. In 2016, Essilor assessed the contribution of its Mission, social, environmental and societal initiatives to the United Nations 2030 Sustainable Development Agenda. What we learned validated the key topics we identified in our sustainability approach and our roadmap. It also highlighted the Group’s major positive social impact to many of the UN Sustainable Development Goals. At Essilor, we believe that business has a significant role to play in solving the increasingly global and interconnected challenges to ending poverty, protecting the planet and ensuring prosperity for all. Find out more in our 2017 Report – Our contribution to the Sustainable Development Goals. As of 31 December 2017, Essilor is included in the following indices: MSCI World ESG & SRI and World Low Carbon Leaders, FTSE4Good, STOXX Global ESG Leaders, Euronext Vigeo Europe 120, ECPI indices, and Ethibel Excellence and Pioneer. In 2017, we were recognized for our leadership in water management by CDP and gained awards for our commitment to the UN Sustainable Development Goals, socially responsible procurement and transparency in communications. In 2018, Essilor was ranked by American magazine Forbes for the 8thconsecutive year among the world’s most innovative companies and has been selected by the Dow Jones Sustainability Index among the world’s best performing companies in terms of sustainable development or the 3rd consecutive year.